Given the strong likelihood that Iran will acquire nuclear weapons, why and how to prevent it from achieving its goal must be based on the assumption that the consequences will be dire should Iran realize its objective. There are two intertwined implications for the Gulf States and Israel in particular that a nuclear Iran presents: the physical and the psychological. Whereas Iran’s physical possession of nuclear weapons can be neutralized through deterrence and containment, the psychological aspect will linger as it will constantly bear a high degree of uncertainty. Together they radically change the geopolitical calculations of the countries in the region as well as outside powers, especially the US, who have significant strategic interests and security obligations to its allies in the region. The first concern is proliferation: There is little doubt that Iran’s possession of nuclear weapons will prompt other countries in the Middle East to follow suit, even though there is widespread consensus among scholars and political leaders that Iranwill not use such weapons against any of its adversaries for two reasons: a) Iran fears retaliatory nuclear strikes by the US and/or Israel will inflict unacceptable damage, and b) possession of nuclear weapons better serves Iran’s strategic interests than their actual use. This, however, does not offer enough comfort to the countries that feel threatened by Iran, like Saudi Arabia and other Gulf states, which are not in possession of similar weapons. They view Iran as an enduring enemy and they are unwilling to live under the cloud of a nuclear threat. Israel, which is believed to have formidable nuclear capabilities, wishes to maintain its nuclear edge and it has not ruled out the possibility that the clergy in Iran, driven by divine forces, may contemplate its use. Saudi Arabia is likely to be the first country to seek nuclear weapons of its own without necessarily going through the process of developing a nuclear program, because the Saudis would need to acquire nuclear deterrence capabilities within a very short period of time once Iran becomes a nuclear power. To that end, the Saudis are likely to purchase “readymade” nuclear weapons from fellow Sunni Muslim state Pakistan. Obviously for the Saudis, money will not be an object as they can spare a billion dollars or two to acquire full-fledged nuclear deterrence capabilities with the assistance of Pakistani nuclear scientists and technicians. That said, the proliferation of nuclear weapons will not be limited to Saudi Arabia; other Arab states, such as Egypt, may well follow suit, especially because Egypt seeks to restore its traditional leadership role in the Arab world and would do everything it can to deny Iran’s hegemonic ambitions. Neither Egypt nor Saudi Arabia nor Iran itself will hesitate to withdraw from the Non-Proliferation Treaty (NPT) once it becomes known that Iran is in possession of nuclear weapons. The second concern is that Iran will become the region’s hegemon equipped with nuclear weapons, which puts it in a position to intimidate the Gulf States and bully them to accept its own political dictates. Iran is already engaged in subversive activity in Bahrain and other Gulf States, fomenting unrest among the Shiite minorities. The old animosity between the Sunni states and Shiite Iran has now assumed an even greater impetus resulting from the wars in Iraq and now Syria, where Iran and Saudi Arabia, joined by other Gulf States, are fighting a proxy war against each other. The third concern is miscalculation: Given the Middle East turmoil, which is unlikely to recede any time soon, the region’s states are already on edge and prone to miscalculation. When survival is perceived to be at stake, the heightened tension narrows the room for careful deliberation and meticulous investigation. Under these conditions, people operate in a sort of crisis atmosphere where time becomes of the essence and the need for immediate action assumes prominence. Thus, miscalculating the enemy’s intentions could lead to preemption with potentially catastrophic consequences. The fourth concern is that certain nuclear-related devices, such as dirty bombs (a combination of radioactive material with conventional explosives), could fall into the wrong hands or even be provided deliberately to certain Islamic extremist groups. That is, the more nuclear weapons and materials that proliferate regionally, the greater the chance that such groups could use them against their enemies, be they Sunni, Shiite or Israeli. Iran could conceivably provide such a weapon to Hezbollah in order to deter Israel from attacking its own nuclear facilities. Moreover, such devices could be stolen by terrorist groups. None of these scenarios can be ruled out because as mentioned earlier, Saudi Arabia, Egypt and perhaps other states may well abandon the NPT and will be left without rigorous and regular inspections by the International Atomic Energy Agency (IAEA). Moreover, there are many Jihadist groups, especially al-Qaeda, who will not miss any opportunity to lay their hands on such weapons. The fifth concern is that the possession of nuclear weapons by Iran runs contrary to the often-repeated desire by the international community to make the Middle East a Nuclear-Weapon-Free-Zone (NWFZ). The point here is that with the exception of South Africa, which dismantled its nuclear weapons under unique circumstances, no country in possession of such weapons has ever dismantled or given up its stockpile. With the collapse of the Soviet Union, several of Russia’s former satellite states — Ukraine, Belarus and Kazakhstan — returned their inherited nuclear weapons to Russia. During the past decade, the US and Russia only reduced their stockpiles. The three newest members of the nuclear club, North Korea, Pakistan and India, are in fact augmenting their inventory of nuclear weapons. The problem here is that once other countries in the Middle East acquire nuclear weapons, it would be nearly impossible to free the region of these awesome arsenals. Indeed, if the idea is to make the Middle East a NWFZ, adding another nuclear power is totally inconsistent with this general objective. Finally, states equipped with nuclear arsenals tend to take greater risks and behave recklessly because of an increased sense of immunity. North Korea exemplifies this behavior and there is no reason to assume that Iran will behave differently. North Korea has occasionally threatened South Korea and heightened tensions with South Korea’s ally and protector — the US. This too could lead to a new conflagration between the Koreas which will most certainly involve the US, a scenario that can be duplicated in the ongoing conflict between Saudi Arabia and Iran or between Israel and Iran. There are those who argue why Iran should be prevented from acquiring nuclear weapons when Israel reportedly has a huge stockpile of such weapons. Right or wrong, Israel feels besieged; it has and continues to be existentially threatened by Iran and not the other way around. As a case in point, Israel had no concern when Pakistan, for example, developed nuclear weapons, because Pakistan never threatened Israel directly or indirectly. This must also be understood in the context of Israel’s deep concerns over national security. Because of historic experiences, there is nothing that can persuade Israel to take existential threats anything but very seriously, and it will stop short of nothing to neutralize such threats. That said, although Israel has all along adopted nuclear ambiguity, neither confirming or denying the possession of nuclear weapons, it has stated on a number of occasions that it will participate in any effort to establish a NWFZ in the Middle East once a comprehensive peace with the Arab and Islamic world, including Iran, is reached and sustained for a number of years in order to become entrenched physically and psychologically. For these reasons, it is absolutely necessary that the longer-term agreement currently being negotiated between the P5+1 and Iran is airtight and could potentially prevent Iran from obtaining a nuclear weapon, however uncertain this prospect may be. To be sure, a nuclear Iran, which may well precipitate the proliferation of nuclear weapons in the Middle East, will be like a dark, massive and thundering cloud hovering over the region, without knowing when and where the gathering storm will strike. Every country will be on high alert, which is a recipe for miscalculation and chaos with unpredictable consequences. Iraqi Shiite cleric and political powerhouse Muqtada al-Sadr has reversed his promise to quit politics. It now looks like gamesmanship ahead of April parliamentary elections. Sadr out of politics? Can a leopard change its spots? On Feb. 16, Mr. Sadr, a Shiite cleric who built a far-reaching political machine in the decade after the UStoppled Saddam Hussein, said he was calling it a dayfor his network of political and social services offices. Powerful Iraqi Shiite cleric Muqtada al-Sadr has withdrawn from politics, overnight dismantling his influential political movement in a move that has stunned his followers and handed a pre-election boost to Prime Minister Nouri al-Maliki. The young cleric announced in a handwritten note posted on his movement’s website Sunday that he was immediately withdrawing from politics and dissolving the party structure to protect his family’s reputation. It turns out he didn’t mean it. Perhaps he was instead looking to shore up his own image as a champion of the poor, unsullied by the political corruption that is endemic in Iraq. Since the announcement, the leadership of his Ahrar political bloc has been reshuffled and the group has announced its intention to field candidates in the April election. Ahrar was pivotal in helping Shiite Prime Minister Nouri al-Maliki retain power after Iraq’s last election. But Sadr has become a leading critic of the Iraqi premier, who hails from the Dawa Party, a rival Shiite Islamist group. Sadr has railed against government corruption and accused Mr. Maliki of taking on dictatorial powers. While Sadr’s claim of a withdrawal from politics was seen as a boost for Maliki, the fact that Ahrar will be in the race – with the money and prestige of Sadr behind it – is bad news for the prime minister. In a speech shortly after his announcement, Sadr once again denounced Maliki as a tyrant and hinted that he’s a tool of both the US and Iran. It’s hard to imagine Sadr leaving politics entirely. Iraq’s Shiite clergy, particularly during the rule of Saddam Hussein, was often crudely divided into two camps: The speaking hawza and the silent hawza, a reference to the main Shiite seminary in the Iraqi city of Najaf. The silent hawza were senior clergy like Ayotallah Ali al-Sistani, who tried to remain detached from politics. The speaking Hawza were clerics like Sadr’s father, Ayatollah Mohamed Sadik al-Sadr, who saw religion and faith as inseparable and was murdered, along with two of his sons, in Najaf on Hussein’s orders in 1999. Within days of Hussein’s ouster, Saddam City, a teeming Shiite slum in Baghdad’s northeast, was renamed Sadr City in honor of Muqtads’s father and uncle, also killed by the former dictator. That reverence, which has been bestowed on Muqtada as well, stems from their willingness to take on the state – and to die if need be. The Sadr legacy is a powerful one in Iraq. But a Sadr who shrinks from politics in favor of the quietest style of Mr. Sistani is no Sadr at all. Iraq, which is gearing up for elections in its most politically violent environment since 2008, has not seen the last of the mercurial preacher. Expect him to play an important role in determining the election’s outcome. Iraqi soldiers take part in an intensive security deployment in Sulaiman Pek, 160 km (99 miles) north of Baghdad, February 21, 2014. (Reuters) – Iran has signed a deal to sell Iraq arms and ammunition worth $195 million, according to documents seen by Reuters – a move that would break a U.N. embargo on weapons sales by Tehran. The agreement was reached at the end of November, the documents showed, just weeks after Iraq’s Prime Minister Nouri al-Maliki returned from lobbying the Obama administration in Washington for extra weapons to fight al Qaeda-linked militants. Some in Washington are nervous about providing sensitive U.S. military equipment to a country they worry is becoming too close to Iran. Several Iraqi lawmakers said Maliki had made the deal because he was fed up with delays in U.S. arms deliveries. A spokesman for the Iraqi prime minister would not confirm or deny the sale, but said such a deal would be understandable given Iraq’s current security troubles. “We are launching a war against terrorism and we want to win this war. Nothing prevents us from buying arms and ammunition from any party and it’s only ammunition helping us to fight terrorists,” said the spokesman, Ali Mussawi. The Iranian government denied any knowledge of a deal to sell arms to Iraq. It would be the first official arms deal between Shi’ite Iran and Iraq’s Shi’ite-led government and would highlight the growing bond between them in the two years since the departure of U.S. troops from Iraq. The U.S. State Department said it was looking into the reports. “If true, this would raise serious concerns,” State Department spokeswoman Jen Psaki told a news briefing. “Any transfer of arms from Iran to a third country is in direct violation of UNSCR 1747. We are seeking clarification on the matter from the government of Iraq and to ensure that Iraqi officials understand the limits that international law places on arms trade with Iran,” Psaki said, referring to the U.N. resolution that imposed an arms embargo on Iran. A U.S. official said such a deal could further complicate Washington’s approach to negotiating with Iran on easing international sanctions over its nuclear program, which the West suspects is aimed at producing bombs. Iran says its aims are purely peaceful. Asked at the Washington briefing if the deal could have come about due to Iraqi frustration at the slowness of U.S. deliveries, Psaki said the United States was committed to supporting Iraq and had provided it with more than $15 billion in military and security equipment, services, and training. “We’re working to accelerate our … deliveries of critical CT (counterterrorism) equipment,” she said. Psaki said recent U.S. shipments included Hellfire missiles, hundreds of small arms and large quantities of small arms and tank ammunition. She said the U.S. government had also notified Congress of plans to supply Iraq with Apache helicopters. U.S. Secretary of State John Kerry reiterated U.S. support for Iraq’s fight against militants and discussed the security situation in the Iraqi province of Anbar in a call with Iraqi Foreign Minister Hoshiyar Zebari on Saturday, Psaki said. A U.N. diplomatic source close to the U.N. Security Council’s Iran sanctions committee was aware of the Iran-Iraq arms deal and voiced concern about it, while declining to disclose details about those concerns. The source spoke to Reuters on condition of anonymity. The official documents seen by Reuters showed that six of eight contracts were signed with Iran’s Defense Industries Organization to supply Iraq with light and medium arms, mortar launchers, ammunition for tanks as well as artillery and mortars. A final two contracts were agreed to with the state-owned Iran Electronic Industries for night vision goggles, communications equipment and mortar-guiding devices. One of the contracts includes equipment to protect against chemical agents. An Iraqi army major with knowledge of procurement issues said that would include items such as gas masks and gloves, as well as injections. Baghdad has expressed fear the militants will use such agents against its forces. Officials from the Iraqi and Iranian defense ministries signed the agreements, according to the documents. They did not list a timetable for deliveries and it was not possible to confirm whether they had taken place. Maliki has been engaged in a nearly two-month-old battle in western Iraq against Sunni al Qaeda-inspired militants and rebellious tribesmen. The prime minister has blamed the unrest in Anbar on the conflict spilling over from neighboring Syria. One Western security official said U.S. government experts believed an Iranian-Iraqi arms deal had been in the works for some time. The growing friendship between the two countries is discomfiting for the United States, which has accused Iran of having shipped arms to the Syrian government through Iraq. Iran already supplies Baghdad with electricity and gas and reiterated an offer of military assistance in January. The weapons purchases amount to a drop in the ocean for Iraq, which receives most of its arms from the United States and has also bought weapons and helicopters from Russia and other countries. But they are politically significant as Maliki purses a third term in office. Iraqi politicians consider Iran’s blessing as a necessity for seeking power. Maliki won his second term in 2010 only after the Iranians exerted pressure on recalcitrant Shi’ite parties on his behalf. Many Iraqis accuse Iran of funding Iraqi Shi’ite militias who have seen a resurgence in the last two years as Iraq’s security has deteriorated. Images of Iran’s Supreme Leader Ali Khamenei now decorate posters seen around Baghdad of Iraqi Shiite fighters slain fighting in Syria. “We have here a political and not a military deal,” said Amman-based Iraq analyst Yahya al-Kubaisay from the Iraqi Center for Strategic Studies, a think tank filled with political opponents of the Shi’ite-led Iraqi government. Three Iraqi lawmakers, who said they had knowledge of the deals, argued they were due to Maliki’s unhappiness with Washington’s response to his request to supply Iraq with arms and ammunition to fight militant groups during his visit late last year. Iraq has long complained the timetable for U.S. weapons and aircraft delivery was too slow. “The Americans were obviously dragging their feet from implementing the arms deals signed with Baghdad and under different pretexts, and that was a reason to get urgent shipments from Tehran,” said one of the lawmakers, who spoke on condition of anonymity due to the sensitivity of the subject. In recent months, the U.S. government has delivered Hellfire missiles and surveillance drones to Iraq as part of its long-standing relationship with Baghdad, which it invaded in 2003. It has also supplied Iraq with M1 Abrams tanks and is in the process of delivering F-16 fighter jets. Since fighting broke out in western Anbar in January, Washington has pushed to move ahead with the sale of 24 Apache attack helicopters to Iraq, which had been held up for months due to the concerns of U.S. lawmakers about how Maliki, who is increasingly at odds with minority Sunnis, would use them. A Shi’ite lawmaker close to Maliki said the deal with Iran sent a message to Washington that threatening to withhold or delay arms purchases would no longer work. “If you went to a shop to buy a toy and they refused to sell it to you, then as long as you have the cash, you can get it from the shop next door. It’s as simple as that,” said the official, who also asked to remain unidentified by name due to the sensitivity of the issue. A senior Iraq army officer said Iran was the best source for quick shipments as some of the arms used by the Iraqi army are similar to those manufactured by Tehran, including assault weapons, mortars, artillery and tank ammunition. Iran even produces ammunition for U.S.-made M-12 assault rifles, used by the Iraqi military. Maliki defended Iraq’s counterterrorism strategy last week in an editorial published on the website of the influential U.S. journal Foreign Policy: “Thanks to our rapidly growingeconomy, we are able and willing to pay for all the military equipment we need,” he wrote. New Delhi : Everything is available in Pakistan, even a nuclear bomb, if looked for properly, IM operative Riyaz Bhatkal told his cousin, arrested Indian Mujahideen member Yasin Bhatkal, during a chat, the NIA said Monday. In a charge sheet filed in a Delhi court, the National Investigation Agency (NIA) said that Yasin Bhatkal and his cousin Riyaz, who is believed to be in Pakistan, had a conversation on June 1, 2013, during which Yasin asked if there was a way to procure nuclear bombs that could be used to attack Surat in Gujarat. “Riyaz told A-6 that Muslims will also die in such attack, to which A-6 said that they will place posters in mosques for every Muslim resident to quietly evacuate the town. This clearly establishes the devious intention of the accused A-6, to wage war against India,” said the charge sheet. Earlier in the chat, the two Bhatkal cousins spoke about the “failure” of the July 2008 attempted bombing in Surat that saw several bombs recovered by police and many were defused. “During chat of A-6 with Riyaz on June 1, 2013, A-6 talked about having placed bombs on PS’s (police stations) in Surat. Riyaz told him not to make him remember the Surat failure, which he always remembered. A-6 said that he had himself placed two bombs in the station,” the NIA charge sheet said. WASHINGTON (Associated Press)– The East Coast doesn’t get earthquakes often but when they do strike, there’s a whole lot more shaking going on. The ground in the East is older, colder and more intact than the West Coast or the famous Pacific Ring of Fire. So East Coast quakes rattle an area up to 10 times larger than a similar-sized West Coast temblor. “They tend to be more bang for the buck as far as shaking goes,” said Virginia Tech geology professor James Spotila. Tuesday’s 5.8-magnitude quake was centered in Virginia and was felt up and down the Eastern seaboard for more than 1,000 miles. There hasn’t been a quake that large on the East Coast since 1944 in New York. While this was a rarity for the East, a 5.8 quake isn’t unusual for California, Oregon, Washington and Alaska, where one occurs about once a year. Those states have had 103 quakes 5.8 or bigger since 1900, compared to now two in the East. The tiny island of Trinidad is more quake-prone than the East Coast, said U.S. Geological Survey seismologist Paul Earle. “In all the years I was at FEMA, there didn’t seem to be a concern for earthquakes on the East Coast,” former Federal Emergency Management Agency chief James Lee Witt said. Because of geology, earthquakes on the coasts have different triggers and act differently in some ways. And they definitely are felt differently. One glaring East versus West disparity: When a quake happens in California, geologists usually know what fault ruptured. Tuesday’s quake happened on an unknown fault, and it is likely to remain a mystery. Because the quake didn’t break the surface “we may never actually map this fault from this earthquake,” Earle said. The only thing that will help scientists figure out where the break truly occurred are the aftershocks which could help highlight or outline the fault line, said Cornell University seismologist Rowena Lohman. Most of the times, quakes occur when Earth’s floating giant plates shift, rub against or slip past each other. That’s what happens along California’s San Andreas fault when quakes happen there. Tuesday’s thrust earthquake was far from the edge of a plate – the nearest are thousands of miles away in the mid-Atlantic or California, said seismologist David Applegate, associate director of natural hazards for the USGS in Reston, Va. The stresses that cause these kinds of quakes come from far away and mount ever so slowly over time, even building up from the retreat of glaciers at the end of the Ice Age, he said. Another East versus West contrast: The ground is different in the East in a way that makes the shaking travel much further, allowing people to feel the quake several states and hundreds of miles away. The rocks in the Earth’s crust in the East are colder, older and harder, which means seismic waves travel more efficiently and over greater distances. Rocks on the West Coast are relatively young and broken up by faults. “An intact bell rings more loudly than a cracked bell and that’s essentially what the crust is on the East Coast,” USGS seismologist Lucy Jones told a news conference in Pasadena, Calif. In the East, hurricanes are the worry far more than quakes. Former FEMA chief Witt said people on the West Coast know what to do in an earthquake: drop to the floor, cover their heads and hold on to something sturdy until the shaking stops. That’s what USGS’s Applegate did in Virginia. In 2007, an earthquake hit the area surrounding Japan’s Kashiwazaki-Kariwa nuclear power plant, the world’s largest. The International Atomic Energy Agency determined ”there was no significant damage to the parts of the plant important to safety,” from the quake. According to the agency, “The four reactors in operation at the time in the seven-unit complex shut down safely and there was a very small radioactive release well below public health and environmental safety limits.” The plant, however, remains closed. Al Sadr’s retirement a bluff? Shiite cleric Moqtada Al Sadr speaks in Najaf, 160 km south of Baghdad on February 18, 2014. Without a shadow of doubt, Moqtada Al Sadr is the fastest “learner” in post-2003 Iraqi politics. The young man has visibly evolved from a dark and erratic cleric, with a strong speech impediment and oversized legacy, into a strong-minded, charismatic and wise power-broker and king-maker. He is now the point of gravity in Shiite politics, speaking on behalf of young people and the community’s poverty-stricken masses. He is to them what Imam Mousa Al Sadr was to Lebanese Shiites prior to the Civil War. No name can be more familiar to young Iraqi Shiites growing up in post-Saddam Hussain Iraq. The young man, who smiles little but poses frequently for photographers, is the scion of a leading Shiite family that kept Saddam awake at night, refusing to accept 34-years of Baathist autocracy. Moqtada did the same to US troops after their 2003 occupation of Iraq, leading an uprising against them in Najaf, Sadr City and Basra. Since then, the man has captured world headlines and become a magnet for Arab and western media, completely overshadowing more well-established Shiite figures like the Grand Ayatollah Ali Al Sistani or Abdul Aziz Al Hakim and his son Ammar, leaders of the Supreme Council Islamic Revolution in Iraq (SCIRI). Earlier this week, Moqtada announced his retirement from Iraqi politics at the young age of 40. His offices closed down, seven of his MPs resigned from parliament and his entire entourage switched off their phones to avoid speaking to the press. Arabs are not used to early retirement. Moqtada’s decision was shocking — to say the least — and has opened a Pandora’s Box for war-torn Iraq. The announcement took the Iraqi political scene by storm. Moqtada is king of the patron-client system in Iraq. Thousands rely on his protection in the complex world of Iraqi politics. Hundreds of his supporters dot the landscape as civil servants, soldiers, officers, teachers, MPs and cabinet ministers. They feel orphaned and vulnerable without him. They are now an easy target for the wide assortment of enemies that Moqtada has made since 2003, ranging from Al Qaida and the Baathists onto current Iraqi Prime Minister Nouri Al Maliki, who is glad to see the end of Moqtada. Although originally marketed as a prime opponent of Iraqi Sunnis, back in 2005-2006, Moqtada has since evolved rapidly, positioning himself as champion of moderation, coexistence and Sunni rights, in addition to being an ally of secular figures like the former Iraqi premiere, Ayad Allawi. Originally, Moqtada enjoyed a marriage of convenience with Al Maliki. Both were pro-Iran and both wanted an Iran-style theocracy in Baghdad. Al Maliki relied heavily on Moqtada to give him legitimacy in the Shiite slums of Iraq. Young Iraqis knew and loved Moqtada. Al Maliki at the time was a political nobody, emerging from a long exile in Damascus to lead his country after years in the underground. Moqtada helped polish his image and nationalist credentials and in exchange, Al Maliki turned a blind eye to Moqtada’s militia — the Mehdi Army. It was involved in target assassinations and kidnappings, deeply immersed in systematic street terrorism against its former enemies. Al Maliki protected him from the dragnet of the US army and from the laws of the new Iraqi government. However, the relationship turned sour in 2008. Al Maliki felt strong enough to break with Moqtada and started seeing him as more of a threat — and a burden in Washington circles — than an asset. Learning from the Hezbollah model in Lebanon, Moqtada gave the Mehdi Army a major facelift, rooting out wild and extremist jihadist elements. He banned all illegal practices, developed a coherent domestic policy, improved his speaking skills and returned to Iraq to further his religious credentials, studying at Qum to elevate himself in the clerical ladder of Shiites. His team began operating schools, social welfare programmes and hospitals. He was clearly bracing himself to become an Iraqi version of Hassan Nasrallah. By 2010, nothing could pass in Iraqi politics without first being signed off by Moqtada. If Moqtada’s resignation is genuine, it means Iran has finally got him to step aside, in favour of Al Maliki. The country can no longer cope with two rival Shiite leaderships. Tehran wants one unified Shiite authority in Iraq and it has to be the Iraqi prime minister, who is preparing for a third round at the premiership next April. Moqtada’s resignation means that he will not oppose Al Maliki’s bid in two months, which is music to the ears of Iranian officialdom. However, what if Moqtada is bluffing? We do not have many examples of Arab politicians stepping down before their time is up. Jamal Abdul Nasser is one. He resigned after the fiasco of 1967. Nasser took responsibility for the defeat and stepped down, triggering massive demonstrations in all four corners of the Arab world. The masses begged him to reconsider, and Nasser did — emerging more powerful than ever before. Nasser’s resignation was a bluff. Perhaps Moqtada wants Iraqi players — and Iran — to beg him to reconsider. If he does, he will certainly have a long list of conditions: Better representation in the Iraqi government, more autonomy in his Shiite fiefdoms and no to Al Maliki. Sami Moubayed is a Syrian historian and former Carnegie scholar in Beirut. He is the author of Syria and the USA (IB Tauris, 2012) and co-founder of http://www.syrianhistory.com, the first online museum of Syrian history. WASHINGTON — Crown Prince Salman bin Abdulaziz, who is Saudi Arabia’s deputy prime minister and defense minister has just concluded an official visit to Pakistan. Some defense experts say that Saudi Arabia’s close military ties with Pakistan, though not new, now have a new dimension – namely countering the threat of a nuclear-capable Iran.Some security experts fear that one of the unintended consequences of international efforts to reach a nuclear deal with Iran could be to put its Gulf rival Saudi Arabia on a fast track to boost its own military capability in an unprecedented way. Ali Sherazi is Pakistan’s former ambassador to Saudi Arabia, and speaking to VOA’s Deewa Radio he says Riyadh may fear a nuclear deal could end economic sanctions on Iran, enabling it to secretly pursue its ambitions. With one of the largest armies in the world and the only declared nuclear power among the Muslim states, Pakistan is in a unique position to assist Saudi Arabia with its defense needs. Sarfraz Khan, the chairman of the Area Study Center at the University of Peshawar, says Iran and Saudi Arabia have conflicting interests in the region and Pakistan can strengthen the Saudi position. “To counter Iran’s influence, Saudi Arabia has often looked towards Pakistan’s help,” he told Deewa Radio. Last year, the BBC reported that Saudi Arabia has invested in Pakistan’s nuclear weapons projects. Both Pakistan and Saudi Arabia denied the report. This cooperation comes in many forms, including training of Saudi pilots by the Pakistan Air Force and the deployment of Pakistani troops to Saudi Arabia to provide security. Nauman Wazir, a defense analyst and former air commodore of Pakistan’s Air Force, says now Pakistan may sell JF-17 Thunder combat jets and trainer aircraft to Saudi Arabia. “For Saudi Arabia, there is no better aircraft than the JF-17 as a trainer and as a fighter plane. It has the capability to support the troops on the ground,” Wazir told Deewa. But the two countries’ joint statement does not specify if the Saudis are interested in buying jets from Pakistan. Ali Sherazi also says say Iran is not the only reason Saudi Arabia wants close military ties with Islamabad. They say Pakistan can also help the oil-rich kingdom combat the threat from al-Qaida and border incursions from neighboring Yemen. “Al-Qaida is also seen as a threat in Saudi Arabia. On top of that the regional situation like the infiltration from Yemen is a factor and that makes the Saudi threat perception multi-dimensional,” Sherazi said. Pakistan has its own disputes with Tehran largely focused on the tense border between Iran and Pakistan’s Balochistan province. Five Iranian border guards were seized recently by militants and taken across the border into Balochistan, prompting Iran to warn that it might send forces across the border to free them. Pakistan expressed “serious concern” over the remarks and tense ties with Iran are likely to push Islamabad and Riyadh closer together say analysts. 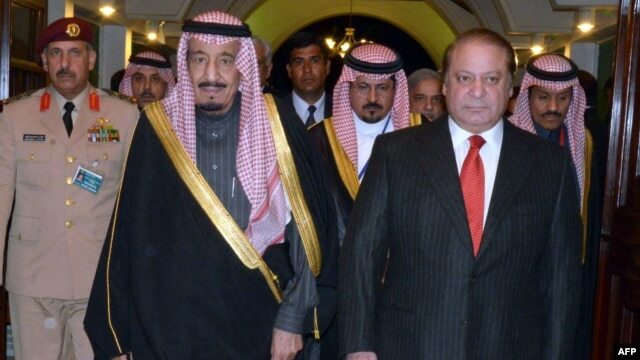 Pakistan’s Prime Minister Nawaz Sharif also enjoys exceptionally close ties with senior members of the Saudi royal family. When Sharif was toppled in a bloodless military coup in 1999, Saudi Arabia intervened and military chief, Pervez Musharraf allowed Sharif and his family to travel into exile in Saudi Arabia. Mehmood Shah, a former Pakistani army brigadier and senior official in Pakistan’s intelligence agency, the ISI says those close ties will only strengthen ties between Islamabad and Riyadh. “During former President Zardari’s tenure relations with the Kingdom of Saudi Arabia were not really warm but as we know that PM Sharif has good relations with the Saudi ruling family and that further strengthens the bilateral ties,” Shah told Deewa. Sales of Iranian crude oil rose by 100,000 barrels a day in January, to 1.32 million, the International Energy Agency reported on Thursday in its monthly survey, offering what appeared to be a glimpse at the initial impact of the temporary nuclear agreement that eased some of the Western sanctions against Iran. American supporters of strong sanctions against Iran seized on the increased oil sales as new evidence that the temporary agreement, negotiated in Geneva in November and put into effect last month, had disproportionately favored Iran. The Obama administration said at the time the agreement was reached that Iran’s oil exports would not increase, remaining around one million barrels a day. “It is clear that the Geneva negotiations and the signing of the interim agreement significantly altered the outlook for Iran’s oil market and overall economy, due to both the easing of restrictions and the reduced risks for purchasers and traders,” said Mark D. Wallace, the chief executive of United Against Nuclear Iran, a group based in New York that has supported stronger sanctions. The International Energy Agency, a group based in Paris that represents 28 energy-importing countries, including the United States, said China accounted for most of the Iranian increase, at 95,000 barrels a day. Small increases in imports by Japan and India were offset by small reductions in imports by South Korea, Taiwan and Syria. The Iranian data compiled by the agency is a closely watched barometer of the effect of sanctions on Iran, which suffered a huge drop in oil industry revenue in the past few years. Under the temporary nuclear accordbetween Iran and six world powers, Iran agreed to suspend most nuclear activities in exchange for a modest easing of sanctions. The easing included a suspension of a United States restriction that would have forced Iran’s oil buyers to cut their imports to avoid big penalties. Another provision will allow Iran to have access to $4.2 billion of its own money that has been frozen in foreign banks. Most Western sanctions against Iran remain in force, including a European oil embargo and extensive prohibitions on international banking transactions. The Obama administration has warned repeatedly that the temporary agreement should not be interpreted as a signal that these sanctions will be dismantled. The agreement between Iran and the so-called P5-plus-1 group of countries, comprising the five permanent members of the United Nations Security Council — Britain, China, France, Russia and the United States — plus Germany, was intended to allow negotiators more time to reach a permanent accord on the disputed nuclear program, which Iran says is peaceful but other nations suspect is a cover for achieving the ability to make atomic bombs. The first talks on a permanent accord are scheduled for next Tuesday in Vienna. The oil data came a day after the International Monetary Fund, in its first on-the-ground assessment of Iran’s economy in nearly three years, said the country faced anemic growth and rampant inflation, caused in part by the effects of the sanctions. Although optimism over the temporary nuclear accord may have helped stabilize Iran’s decline, the fund’s report said Iran remained economically weak and vulnerable. Trapped in a paradox, the Obama administration asks Pakistan to hold back its nuclear arms transfer to Saudi Arabia to avoid upsetting the six-power nuclear talks with Iran. This is hugely ironic. Washington seeks to curb the nuclear race triggered by its own acquiescence to Iran’s price for diplomacy – recognizing its right to enrich uranium. The Pakistani-Saudi nuclear deal is one outcome of Obama’s inconsistent regional policies. Islamabad’s response is revealed in the coming issue of DEBKA Weekly out Friday, along with striking developments on Iran, Syria, Iraq, Lebanon and al Qaeda. Don’t miss this exciting issue.